Very Good. A black family living in the South during the 1930's are faced with prejudice and discrimination which their children don't understand. Trade paperback (US). Glued binding. 276 p. Puffin Modern Classics. Intended for a juvenile audience. Very Good. A feisty African-American girl-Cassie Logan-she grows up in Mississippi during the Great Depression and learns the shocking realities of racism. Cassie finds it difficult to understand why the farm means so much to her father. 224 p. Intended for a juvenile audience. Good. A black family living in the South during the 1930's are faced with prejudice and discrimination which their children don't understand. Trade paperback (US). Glued binding. 276 p. Puffin Modern Classics. Intended for a juvenile audience. Good. A feisty African-American girl-Cassie Logan-she grows up in Mississippi during the Great Depression and learns the shocking realities of racism. Cassie finds it difficult to understand why the farm means so much to her father. 224 p. Intended for a juvenile audience. Kearney, David. Very Good. 320 p. Puffin Modern Classics . Includes illustrations. Intended for a young adult/teenage audience. Intended for a juvenile audience. The Mississippi of the 1930s was a hard place for a black child to grow up in, but still Cassie didn't understand why farming his own land meant so much to her father. During that year, though, when the night riders were carrying hatred and destruction among her people, she learned about the great differences that divided them. Very Good. 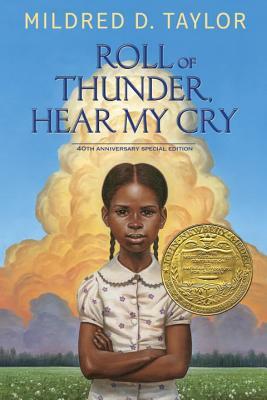 Roll of Thunder, Hear My Cry (Puffin Modern Classics) by Taylor, Mildred D. Trade paperback (US). Glued binding. 276 p. Contains: Illustrations. Puffin Modern Classics. Intended for a juvenile audience. Kearney, David. Very Good. B-format paperback. 320 p. A Puffin Book . Illustrations. Intended for a juvenile audience. 'We have no choice of what colour we're born or who our parents are or whether we're rich or poor. What we do have is some choice over what we make of our lives once we're here. ' The Mississippi of the 1930s was a hard place for a black child to grow up in, but still Cassie didn't understand why farming his own land meant so much to her father. Very Good. One of a series offering classic and contemporary fiction and other literary work for schools, to suit a range of ages and tastes. 208 p. New Windmills KS3 . Intended for a juvenile audience. Kearney, David. Very Good. Set in Mississippi at the height of the American Depression, this book offers a story of a family who struggle to maintain their integrity, pride and independence against the forces of a cruelly racist society. 368 p. A Puffin Book . Includes illustrations. Intended for a juvenile audience. Kearney, David. Good. Set in Mississippi at the height of the American Depression, this book offers a story of a family who struggle to maintain their integrity, pride and independence against the forces of a cruelly racist society. 368 p. A Puffin Book . Includes illustrations. Intended for a juvenile audience.